The Spinnaker promises elegant dining in spite of its location in an airport hotel. 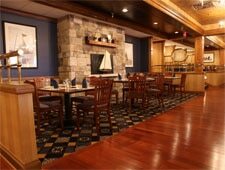 : The Spinnaker promises elegant dining in spite of its location in an airport hotel. Good breakfast is probably a given in a hotel restaurant: Choose among generous-size omelets, french toast and buttermilk pancakes. As for dinner, for years The Spinnaker has been recognized as a good bet for reliable seafood. Great Lakes whitefish and perch come from nearby, but you can count on fresh ocean fish, too. But those who don't care for seafood will find plenty of other offerings, including steaks, maple-pecan chicken, chicken Romano and notable Sunday brunches.